'Tis the season for delicious foods and our thoughts, naturally, have turned to food. From religious holidays to cultural celebrations, there are plenty of occasions around the world where stuffing yourself silly is not only encouraged, it's the main activity. So here are a few more of our favorite feast holidays around the world. Robert Burns is probably Scotland’s most famous poet and it’s no surprise therefore that the country celebrates his birthday each year on January 25th. The dinner starts with a bowl of soup but the star of the show is a traditional haggis. This savory parcel consists of the heart, liver and lungs of a sheep, minced up and flavored with spices, plus chopped onion, suet and oatmeal. Neeps and tatties are the traditional accompaniment. The resultant pudding used to be served in an animal’s stomach, but now artificial membrane is used. 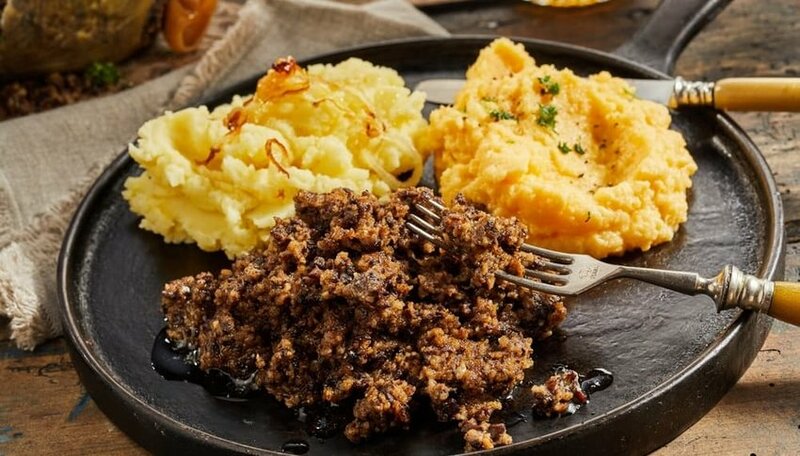 Burns’ poem, “Address to a Haggis” is read out at Burns Night suppers before everyone tucks in. Korea’s harvest festival draws city dwellers back to their family villages to tend gravestones and prepare a joint feast. Songpyeon is prepared on the eve of the festival, a type of rice cake filled with beans, seeds, nuts and honey. Much effort is put into making the songpyeon as pretty as possible, as this beauty is said to be replicated in a partner or child. Other dishes follow, including braised beef ribs known as galbi jjim, savory pancakes called jeon and japchae, or sweet potato noodles. Sweet treats collectively termed "hangwa" are also served. In the UK, you won’t find a turkey served up as early as November, but they are the most commonly served bird at the Christmas table. Years ago, a goose would have been served, but these days most people prefer the leaner meat of a turkey. We serve it with roast potatoes – crispy on the outside and fluffy on the inside – as well as cranberry sauce, roast chestnut stuffing and a selection of vegetables. One in particular polarizes opinion—brussels sprouts are either adored or reviled. 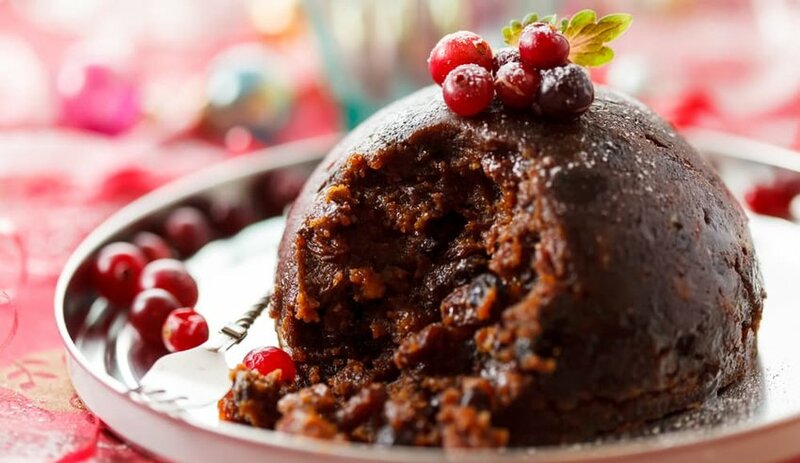 Rounding off this annual feast is a large slice of Christmas pudding, rich with fruit and nuts, and topped with a generous dollop of brandy butter. It’s customary for the pudding to contain a sixpence; the person who finds it will have good luck. Why limit pancakes to just breakfast when you can enjoy them for a whole week? 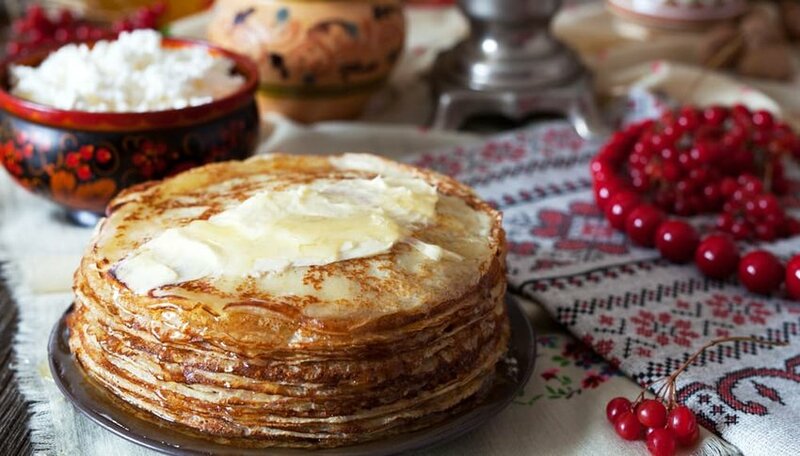 The week-long Maslenitsa festivities precede Lent and together with the burning of straw effigies, symbolize the end of winter and start of spring. The circular shapes of blinis, as pancakes are known in Russia, represent the sun. They’re packed full of butter (maslo means butter) and are topped with sour cream, jam, berries or—most decadently—caviar. 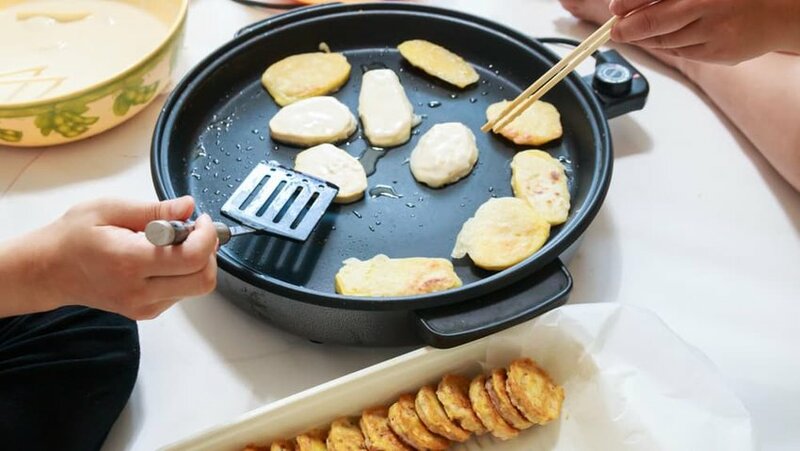 Russians make blinis at home and then deliver them to friends and family. Later in the week you’ll see riders chase away winter on horseback and much eating, drinking and playing games. Persian New Year marks the start of spring and certain foods form an important part of the proceedings. 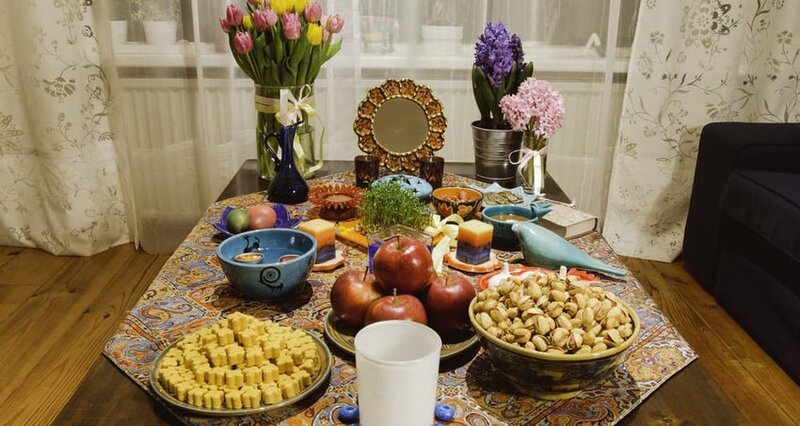 Seven symbolic foods can be found on the Haft-Seen table. The meal also has meaning. Ash-e reshteh, a noodle soup packed with spinach and herbs, represents the beginning of new life. Fish is also served, signifying the hope that food will be plentiful in the months to come. You’ll also find grape leaves stuffed with vegetables, rice and meat on the table – called dolme barg – plus rice flour cookies scented with rosewater and sprinkled with poppy seeds – they’re known as naan berenji. 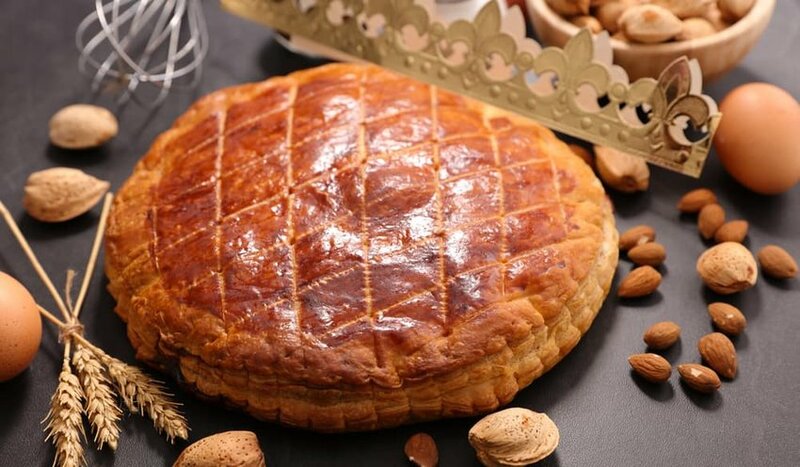 On January 6th, all over France you’ll find people eating a cake known as La Galette des Rois. It marks the feast day of Epiphany, a Christian feast day that signifies the embodiment of God in Jesus Christ. The cake is made with frangipane and puff pastry and is cut into slices. The youngest person present slides underneath the table and randomly allocates pieces of cake to all those present. One contains a toy; the person who receives it becomes “king” for the day and is encouraged to boss everyone else about.